Thank you to Quatro Group for providing me with product in exchange for my honest review. All thoughts are my own. This post may contain affiliate links. Aside from writing, I haven't had time to devote to any one creative outlet. I love singing, but it can feel like a job sometimes, rather than a hobby I enjoy. Reading isn't always possible, as with two kids and a full schedule, I have little free time. When I was younger, I enjoyed doodling. I'm no artist by any means, but I loved my art classes. 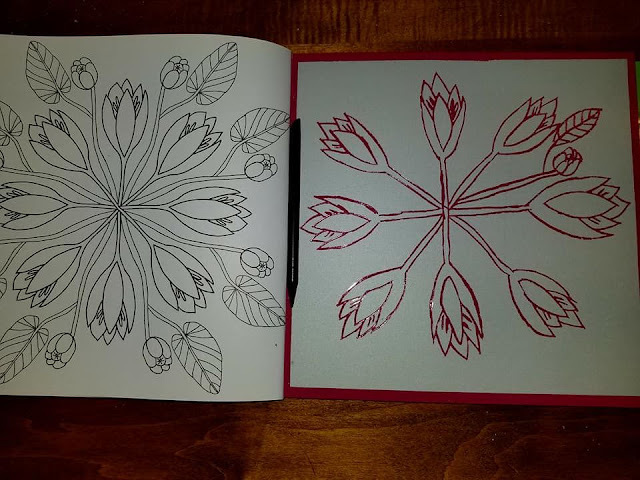 I haven't given much thought to drawing just for the fun of it over the years but was excited when I began seeing adult coloring apps that I could use to 'click and color' or my phone or tablet. I've been spending some time enjoying a new release from Quarto Publishing, by Zoe Ingram, Scratch and Draw Botanicals. I remember doing a lot of tracing and scratch art as a kid. I loved creating my own scenes and was always very proud to present my work to family members or friends. If and when I draw anything, I usually focus on flowers. 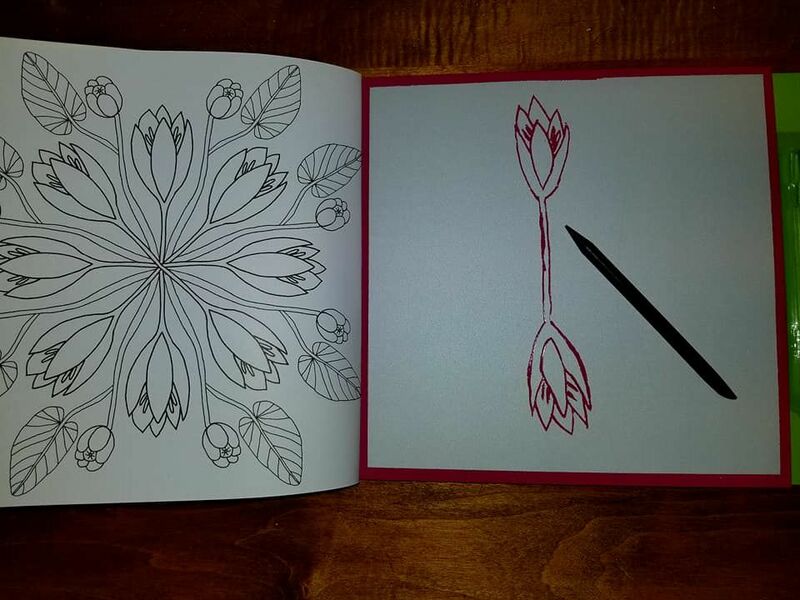 To me, they're a pretty easy object of nature to start with, and anyone can draw a flower. 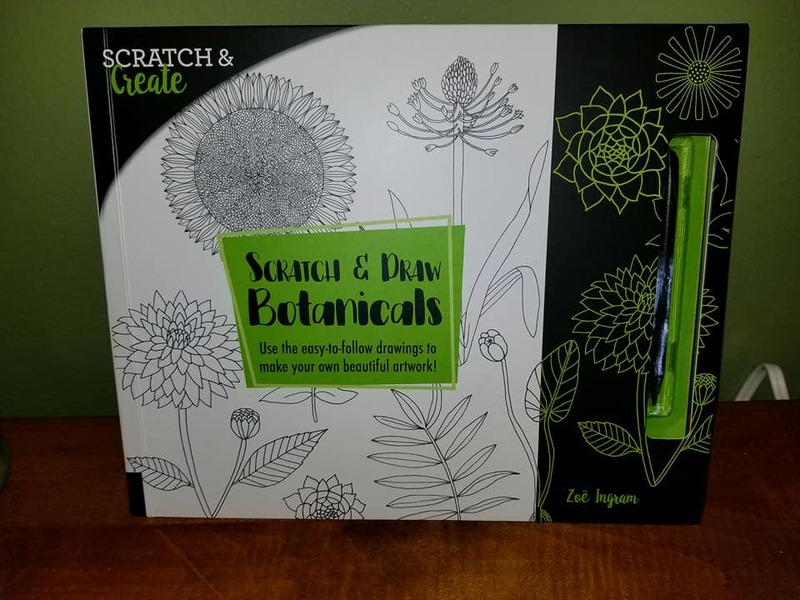 This book is absolutely beautiful and provides you with all of the tools you need to create your own scratch drawings of various botanicals. I started with the very first illustration, and hope to be able to finish it! This unique scratch book features 20 inspirational and decorative illustrations of flowers, leaves, and other botanical designs. Created with simple lines and shapes, you can copy the pattern on the facing page by using the special scratch tool to reveal a contrasting background. Create a simple and beautiful piece of art as you scratch away the metallic coating. 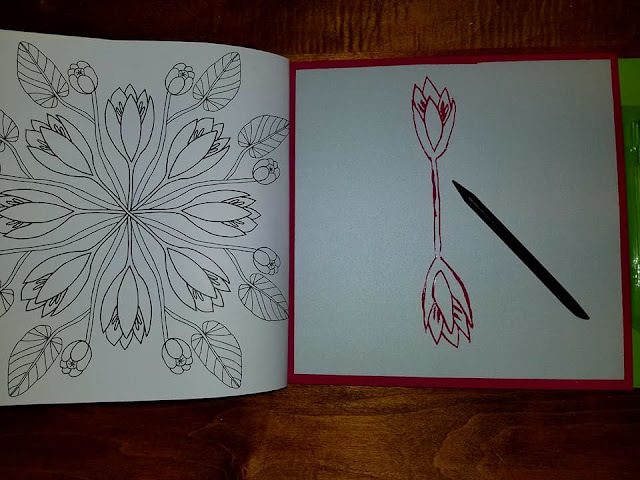 You can copy the example or feel free to make your own variations as you create your own personalized drawing. Your designs are created on perforated pages, ready to tear out and display! Getting used to the scratch tool and applying even pressure will be my biggest hurdle. I had kids in my lap and tugging on my legs as I tried to work on my first piece, so proportions and symmetry are way off! The tool takes a little getting used to. I found some areas harder to actually scratch than others. I'll have to play around with it to get the right balance and pressure. It's so nice that the pages are perforated and can be torn out so the finished work can be displayed. My finished pages may not be 'fridgers,' but I've been enjoying just being able to sit a spell and have some creative 'me time.' I may go off the grid and freehand a few things, too. We'll see if I can get my creative juices flowing that much! If you love to draw or are just looking for an easy way to express your creativity, this is a wonderful book to explore and enjoy. Some illustrations are easier than others to replicate. My 7-year-old is already asking me if he can have some of the pages and the scratch tool so he can make pictures for his friends. Head on over to Quarto to learn more about the book & author. 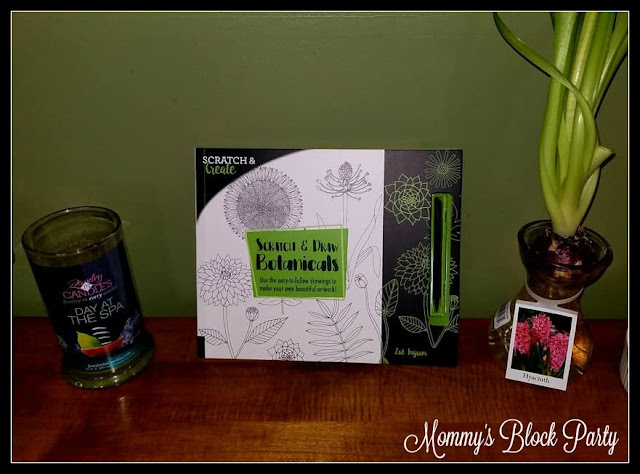 You can purchase Scratch & Draw Botanicals in the MBP Amazon Store for $13.97 (Prime shipping available). Connect with Quarto Group on Facebook and Twitter. 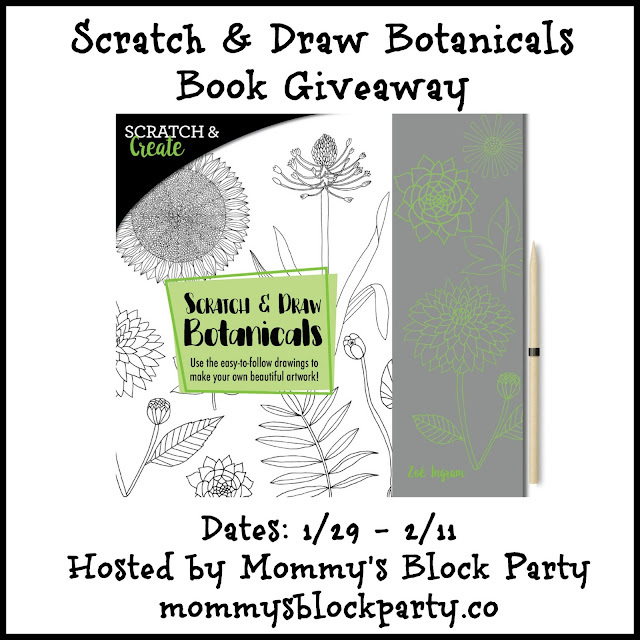 Thanks to our friends at Quarto Group, one lucky MBP reader will win a copy of Scratch & Draw Botanicals ($19.99 RV). Special thanks to our friends at Quarto Group for sponsoring this giveaway. Look for this title in our Valentine's Day Gift Guide! The grandson is always ready to draw with me. I would share this with my cousin.